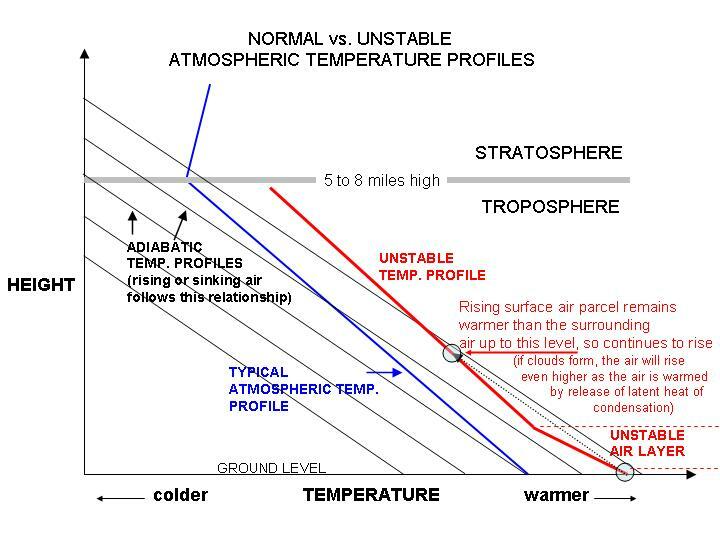 To be "unstable", the lowest layers of an air mass must be so warm and/or humid that, if some of the air rises, then that air parcel is warmer than its environment, and so it continues to rise. This is called moist convection. Normally in the atmosphere, if an air parcel rises, it will be colder than its environment (due to expansion), and it will then sink back down again. This is called a stable airmass. If the rising air parcel contains enough water vapor, however, then condensation of the water vapor in it occurs, and a cloud is formed. This condensation releases heat, which warms the air parcel, which can cause the parcel to rise higher still. This is the basis for thunderstorm formation. The more unstable the air mass, the more energy there is for thunderstorms to feed off of. The thunderstorm transports the extra heat into the upper troposphere, and at the same time cools the lower troposphere. This gradually reduces the instability of the air mass until the moist convection stops. On a sunny day over land, the lowest 1,000-5,000 feet or so of the atmosphere is continuously unstable, with warm air parcels rising from the surface, mixing the whole "boundary layer". This causes turbulence, which you will feel when you take off or land in an airplane on a sunny day.